Masquara($23) is Illamasqua's mascara released as part of the Theatre of the Nameless collection. "Raven" is the only shade available & claims to lengthen, define & dramatize lashes to extremes. The brush looks very promising and the jet black pigment is something I look for in every mascara. Raven has rich, black pigment that looks super glossy. It does a great job of lengthening my stubby lashes with great definition. Does a decent job of separating lashes too. Even after a good 3 coats, it does not feel heavy or weigh down my lashes so much. The formula does not flake and there's very minimal smudging after 4-5 hours. So, I don't have to worry about mascara flecks on my cheeks. Removal is easy since it is not waterproof. If you have sparse lashes like me, you need 2-3 coats to achieve good volume. It does have a tendency to clump after the first coat so be sure to remove excess from the wand before applying. Since the brush is quite big, a lot of precision is required while applying else, you may end up getting a little on the upper lash line. 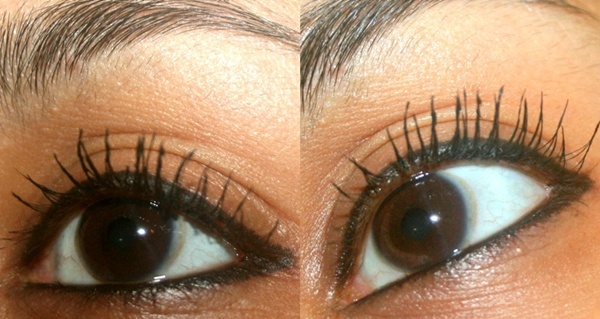 Overall, I see Masquara more as a lengthening mascara than a volumizing one. I really like the end result of long, separated lashes but since I have sparse lashes, I would also love more volume. The rich black pigment is a great bonus that I love. What are your thoughts on Illamasqua's Masquara in Raven? Ooh, this is a nice one! I think I do usually look for volume when I go for mascara, though. Holy long lashes!! But yeah, I need more volume as well. Wow that's a lot of length!Awesome! !